photo (Courtesy of COTECC Website) of Jacobi in action in El Salvador. The top juniors in the Caribbean and Central America have converged in El Salvador for the U16 Junior International Championships(JITIC). Bahamain Jacobi Bain has emerged as one of the best in the region as he has secured a ticket into the finals tomorrow. A consummate tennis player, Jacobi came into the tournament in El Salvador ranked #1 overall. Seemingly he has catapulted himself through the quarterfinals and semifinals easily with wins over Costa Rican Julian Lozano 6-1 7-6(5) and Kaipo Marshall from Barbados 6-2 6-0. The finals will be played tomorrow as Jacobi matches up against a formidable opponent from Costa Rica Christian Winstead. However, Jacobi is well able to meet the competition as he has not dropped a set in tournament play to date. 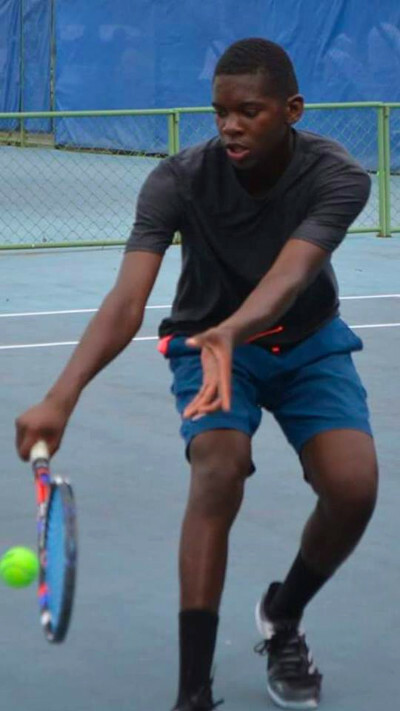 The Bahamas Lawn Tennis Association(BLTA) congratulates Jacobi on a successful tournament thus far and for reaching the finals in a very convincing fashion. We hope he meets with even greater success tomorrow. Let us cheer him on in his quest to be crown the best in 2018 in U16 Junior Tennis in the region !